Artur Tomasevic with his trophy. 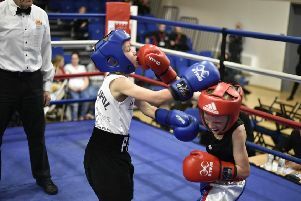 Young city boxer Artur Tomasevic was a fighter in a hurry at a show in Maidstone at the weekend (March 21). The 15 year-old from Eastfield, representing the Peterborough Police Amateur Boxing Club, came up against Robert Long from the Maidstone Gurkhas and stopped him in just 40 seconds to make it two wins out of two. Abbas Shahid Muhammad (right) was pipped on points. Tomasevic delivered some perfect combinations with one right-hand blow smashing and breaking Long’s nose. Long was unable to continue. Senior boxer Daniel Meins (28) from Dogsthorpe was another Peterborough Police winner. He also fought a member of the Maidstone Gurkhas club and won easily on points against J. Craggs. Meins showed great skill and determination on his ring debut, peppering Craggs throughout the bout with slick combinations to both the body and head. Abbas Shahid Muhammad from Millfield was unable to make it three wins out of three for the Peterborough club. He was unlucky to lose a close points verdict to J. Walker from the Westree Club in Kent. Abbas just lost on a very close points decision but coaches Mark Dane and Chris Baker were very pleased with his performance. Daniel Meins (right) won on his ring debut. Baker said: “Abbas has started to box more aggressively on the front foot which is how the amateur judges prefer it. I honestly thought he’d done enough to win the bout. The Peterborough Police club will be holding their first open boxing show at The Focus Youth Centre on Saturday June 6 from 3-8pm. Tickets are available from Chris Baker on 07921 095122. The Peterborough Police team at maidstone. from the left are Mark Dane, Daniel Meins, Artur Tomasevic, Abbas Shahid Muhammad and Chris Baker.